Field results show effectiveness in reducing silica dust to within the Occupational Safety and Health Administration's (OSHA) new exposure limit. Field results show SandTec is effective in reducing silica dust to within OSHA’s new exposure limit...making it the ideal solution for hydraulic fracturing operations to quickly and cost-effectively comply with OSHA’s final rule. ArrMaz’s SandTec®, a silica frac sand coating technology, reduces respirable silica dust generated during hydraulic fracturing by up to 99%. Just last month, the Occupational Safety and Health Administration (OSHA) issued a final rule requiring industries that generate respirable silica dust to reduce the amount of silica dust their employees are exposed to by 50% within five years. ArrMaz is already helping hydraulic fracturing operations quickly and easily meet the new silica dust exposure limit with SandTec. Since 2011, the use of silica sand proppant per well in hydraulic fracturing has been steadily increasing. Exploration and production companies have discovered if they use more sand when performing hydraulic fracturing, they are able to increase well production. The sand helps prop open the formation, allowing hydrocarbons to flow more freely. The transfer of sand proppant, however, generates respirable silica dust which, when inhaled, can impact worker health if not handled properly. Since September 2013, OSHA has been evaluating new proposed regulations for respirable crystalline silica which it estimates affects almost 17,000 workers engaged in support activities for oil and gas operations. On March 23rd, 2016, OSHA announced its final rule on occupational exposure to respirable crystalline silica. The new rule reduces the permissible exposure limit for respirable silica dust to 50 micrograms per cubic meter of air effective June 23, 2016. The hydraulic fracturing industry has until June 23, 2018, two years after the effective date, to comply. The rule also requires that hydraulic fracturing operations use engineering controls as the first line of defense to protect workers against silica dust. The compliance deadline for engineering controls is June 23, 2021. As an engineering control, SandTec is more efficient than bulky mechanical systems (such as vacuum trucks and ventilation equipment) which are difficult to mobilize onsite, require significant space, present handling risks, and are time consuming and expensive to set up, maintain and break down. Mechanical systems also do not provide protection at all transfer points. SandTec solves these challenges by applying a microscopic coating to frac sand proppant to control and minimize silica dust generation whenever and wherever proppant is transferred. “SandTec provides continuous protection from silica dust starting from the sand mine all the way to the hydraulic fracturing wellhead. It is easy to apply with no drying or curing required, and is biorenewable and biodegradeable addressing environmental concerns. 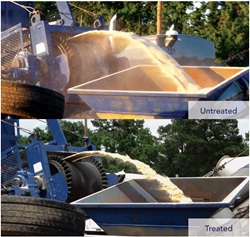 Field results show it is effective in reducing silica dust to within OSHA’s new exposure limit. These characteristics make it the ideal solution for hydraulic fracturing operations to quickly and cost-effectively comply with OSHA’s final rule,” said John Suldickas, Commercial Manager for Oil and Gas at ArrMaz. ArrMaz’s engineers and technical experts continue to work with companies in the oil and gas sector to customize the SandTec system to meet their specific hydraulic fracturing needs. ArrMaz is a global leader in the production of specialty chemicals for the mining, fertilizer, phosphate, asphalt, and oil and gas industries worldwide. Since 1967, ArrMaz has manufactured chemical process aids and additives formulated to optimize process performance and product quality. With headquarters in Mulberry, Florida and multiple locations across North and South America, Europe, Asia, Africa and the Middle East, ArrMaz serves customers in more than 70 countries worldwide. For more information about our company and products, visit us online at http://www.arrmaz.com. “OSHA Fact Sheet – OSHA’s Crystalline Silica Rule: General Industry and Maritime,” The Occupational Safety and Health Administration (OSHA), https://www.osha.gov/Publications/OSHA3682.pdf. “OSHA's Final Rule To Protect Workers From Exposure To Respirable Crystalline Silica,” The Occupational Safety and Health Administration (OSHA), March 23rd, 2016, https://www.osha.gov/silica/. The information contained herein is presented in good faith and believed to be accurate, however, ArrMaz Products, LP assumes no responsibility or liability for the information provided. ArrMaz Products, LP further makes no representations or warranties, either express or implied, of merchantability, fitness for a particular purpose or of any other nature with respect to the information or the product(s) to which the information refers.